A. Finn Enke. 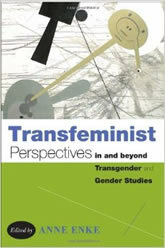 Transfeminist Perspectives in and beyond Transgender and Gender Studies. Temple University Press, 2012. If feminist studies and transgender studies are so intimately connected, why are they not more deeply integrated? Offering multidisciplinary models for this assimilation, the vibrant essays in Transfeminist Perspectives in and beyond Transgender and Gender Studies suggest timely and necessary changes for institutions of higher learning. Responding to the more visible presence of transgender persons as well as gender theories, the contributing essayists focus on how gender is practiced in academia, health care, social services, and even national border patrols. Working from the premise that transgender is both material and cultural, the contributors address such aspects of the university as administration, sports, curriculum, pedagogy, and the appropriate location for transgender studies. Combining feminist theory, transgender studies, and activism centered on social diversity and justice, these essays examine how institutions as lived contexts shape everyday life.